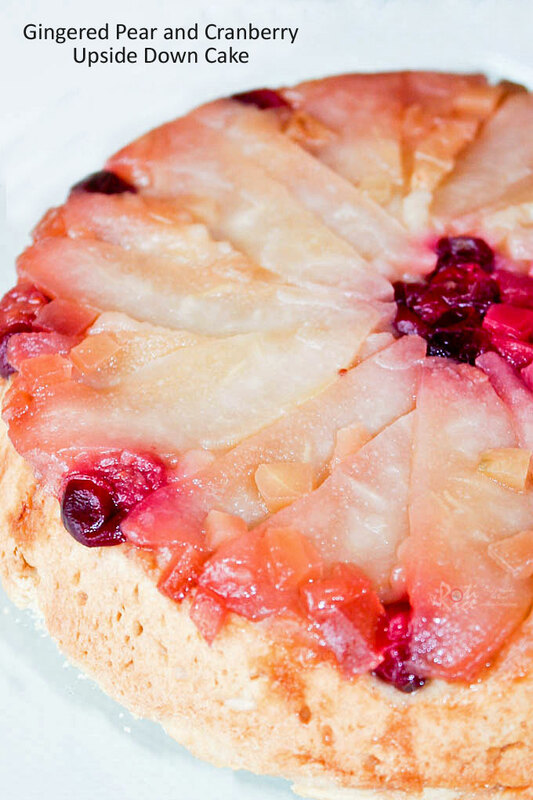 Warmly spiced Gingered Pear and Cranberry Upside Down Cake with gluten free and traditional flour options. Deliciously moist, festive, and perfect for all occasions. I made a gluten free Gingered Pear Upside Down Cake for the Thanksgiving Gathering at a friend’s house during the recent Thanksgiving holidays. As I was in a rush, the pictures I took did not turn out well. The cake though was delicious and not a crumb was left. There was no chance for me to remedy my pictures. Since we were having company this past weekend, I decided to bake the cake again. This time I added some cranberries to reflect a different holiday. I was curious as to how it would taste if I used regular all purpose flour and so I made two Gingered Pear and Cranberry Upside Down Cake with the same recipe but swapped out the flours. Both cakes were very similar in taste and I served everyone except the gluten intolerant, a slice of each without telling them which was gluten-free and which was not. They could easily differentiate the cakes but could not decide which they liked better. The gluten free cake has a finer texture but it crumbled more easily. The traditional one has a more springy texture and held together better. Taste wise, I personally preferred the gluten-free cake. Both cakes were equally moist. I loved the crystallized ginger in the cakes. 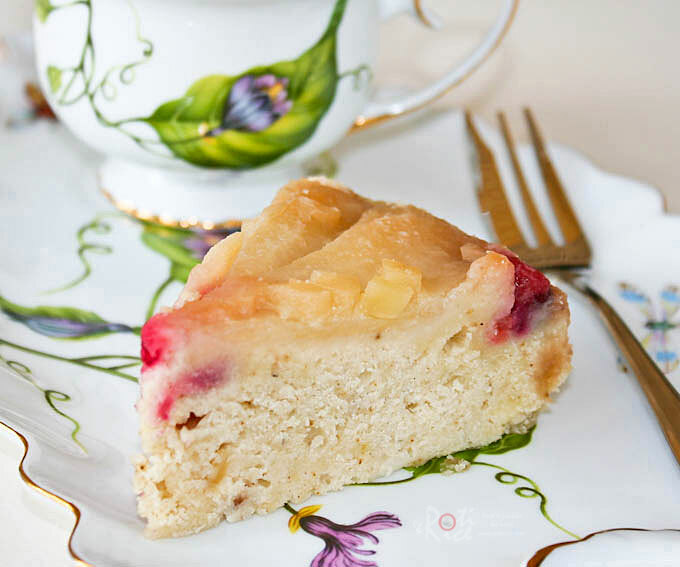 The little bits of cranberries at the ends of each slice lend a slight tartness to the first and last bite. 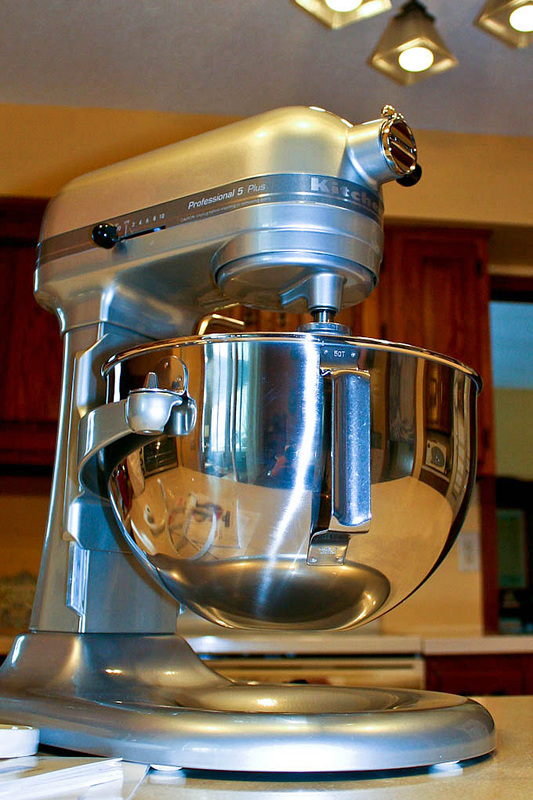 A KitchenAid Professional 5 quart stand mixer in metallic chrome. It’s a beauty! This recipe was adapted from the KitchenAid booklet that came with the stand mixer. And now, let’s start baking! Combine brown sugar and butter in a small saucepan. Cook and stir over medium heat until sugar has melted, about 3 minutes. Remove and pour evenly into cake pan. Sprinkle evenly with chopped crystallized ginger. Arrange pear slices and cranberries decoratively over sugar mixture. Set aside. Pre-heat oven to 350°F (180°C). Combine flours, guar gum, baking powder, nutmeg, cloves, crystallized ginger, and salt in a medium sized bowl. Set aside. Add flour mixture and milk. Beat for about 30 seconds. Increase speed to high and beat for another minute. Spread batter evenly in cake pan over pears and cranberries. Bake for 50 minutes. Let cake stand in pan for 5 minutes. Invert cake onto plate, keeping plate and pan firmly pressed together. Replace any fruit stuck to the bottom of the pan. Pre-heat oven to 350°F (180°C). Combine flours, baking powder, nutmeg, cloves, crystallized ginger, and salt in a medium sized bowl. Set aside. This is the all-purpose flour version. I simply love my KA too, getting it to work quite often lately. Hehe! That’s a very lovely gift you’ve got there:D Delicious cakes too…so pretty! Hooray! A kitchenaid mixer! My girlfriend got me one for my wedding and I LOVE it. It is a life saver. I hope you get a ton of use out of it – I know you will! This cake looks absolutely amazing. I love that you tried it two different ways to compare results… and it’s so fun that you did a taste test with your guests. I bet both were equally delicious. Both cakes look fantastic – I’m looking forward to trying them. Wishing you many happy years of mixing and baking with your wonderful Christmas prezzie. Now you have a really cool kitchen gadget to play with all the holiday recipes! The upside down cakes looks wonderful! Ohh…I’m so envy you now. I wish I can have one of kitchen aid mixer too. 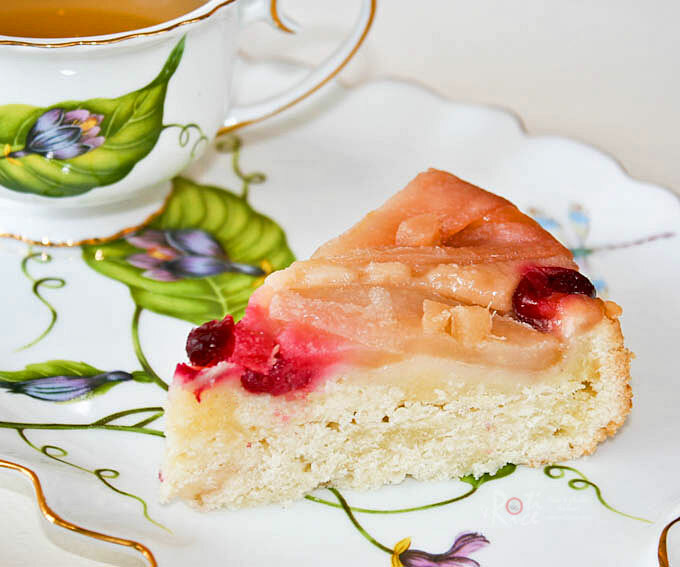 I love your gingered pear and cranberry upside down cake. All the ingredients sounds so tasty. Thank you for sharing. Cool! I am sure you love yours as much as I love mine. 😉 This baby is powerful. Can’t wait to try kneading some bread with the dough hook. What a fun experiment to make the cakes two different ways! I’ve only had a gluten-free cake once and I didn’t like the texture, but who knows. Congrats on your new mixer! Aren’t kitchen toys fun?? I’m super jealous of you Biren! I’ve been wanting a stand mixer forever but it’s kinda pricey. I bet you will be baking like crazy hehe. The cranberries are great twist for Christmas. I also like that your compared the two versions and told us the differences! What kind of pear did you use? I’ve seen a few types but don’t know which one is better. I am sure you will get one in the coming Christmases 🙂 For this cake I used d’Anjou but Bartlett would also work. Try to get a firm pear, one that is slightly green. Congratulations on your new toy, how exciting this must be for you! It sure is a beauty! Your cake looks beautiful. I love the shot with the pear slices and cranberries all laid out gorgeously. I don’t think I’ve tried a gluten-free cake before. Have fun baking! Oh what a lovely cake! The KitchenAid stand mixer is one of my favorite toys too. I definitely bake more after getting it for my birthday one year. Enjoy!! 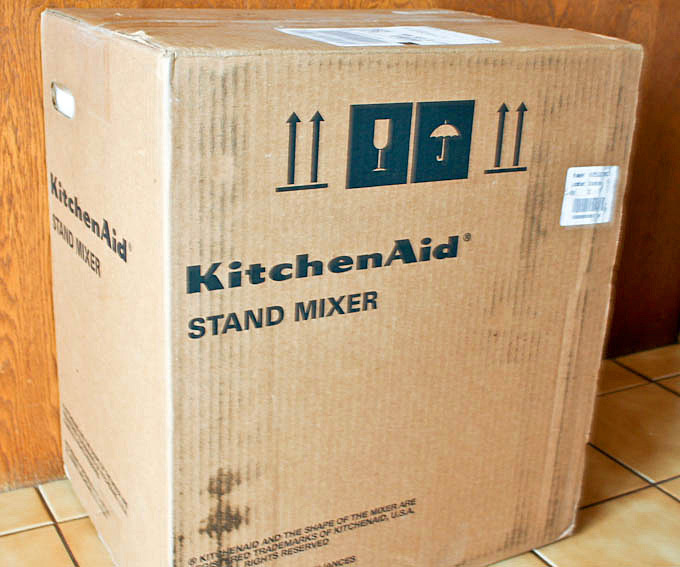 Congratulations on your new mixer! Now you can play more often in the kitchen with your new toy! The cake is lovely and looks very good. Love the addition of cranberries. Enjoy your KA! I did some upside down cake while I was in school & haven’t really baked anything since 2 yrs ago. I did Pineapple Tarts at a friend’s place. Envy, wish I’ve a mixer too! Just received a digital scale on my bday, forcing me to start baking soon. But then again, I’d need a mixer. Hahaha! I’ve tons of lame excuses. I love how you’d beautifully arranged the fruit slices. Yum-yum! Wow, look at that mixer standing tall and glorious! And beautiful festive cake indeed. A festive and beautifully arranged upside down cake. I really like what you did with the cranberries – gives it such great color. Wow! Lovely cake and lovely mixer – I would like both right now! I baked a Christmas cake last evening using my simple and trusty hand mixer – it took me forever to cream the butter and sugar and I was just wishing for one of these KA mixer. Guess I will have to give the hubby a big hint, eh? The cranberries on the cake gives it such a festive ambience. Thanks for sharing, Biren. Interesting with the 2 cake versions. It looks and sounds delicious! Way to go with your new KA mixer! It puts mine to shame as it is so old but going strong! What a lovely gift! The cake is awesome! That is a gorgeous mixer and a lovely cake! The cranberries and the crystallized ginger make it really stunning so festive! 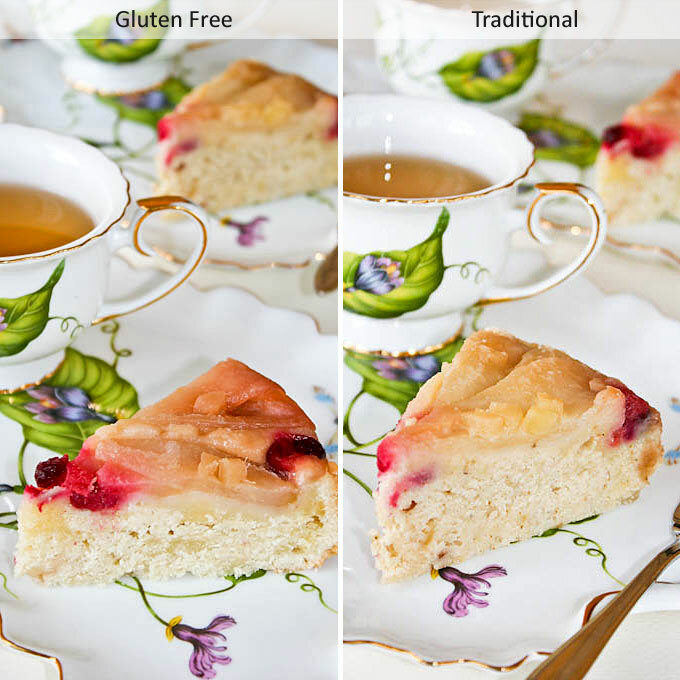 I enjoyed reading your comparison between the gluten-free and non gluten-free cakes…I would love to try the gluten-free version! Oh my!! Your website looks fantastic. See, I have stopped blogging for so long, I missed your lovely new site. Ohhh do I dare to migrate to wordpress? I have been thinking about it. Should I? The cake sounds terrific! I really like the addition of crystallized ginger, excellent! Congrats on your new kitchenaid! Hey Biren, these pictures aren’t half bad at all;) I think they are kind of pretty. Plus, the cake sounds wonderful anyway. I love that it is gluten free-might try this one too! Your cake is so pretty Biren! And the flavors are incredible. Crystallized ginger does amazing things for baked goods! Enjoy your shiny new gift – it’s a beauty! Luucky girl to get a kitchenaid! This sounds delicious! I love that you used tart cranberries to balance out the sweetness. Delicious. Beautiful cake, but what really caught my eye are those exquisite plates and cups. Gorgeous. So all holiday cookies and cakes are gonna be easy right!!! YAAAAY!! Kitchenaid!!! LOL I loved hubby just a little bit more when he got me one for my birthday last year. Sadly, mine already has a short but deep scratch on it *sigh* Almost broke my heart – I really am sooooooo clumsy! Be careful with yours – it’s so beautiful!!!! Both the cakes look scrumptious, but I think I like the texture of the gluten free one more…. Ok, since I know it’s the star, I’ll start with the cake, which is gorgeous. I love the combination of pear, ginger and cranberry (anything with ginger gets my vote). Thanks for sharing your adaptation. Now, the mixer; ::sigh::. I’m in love. I want one SO badly. Oh, please send Santa my way, ok? 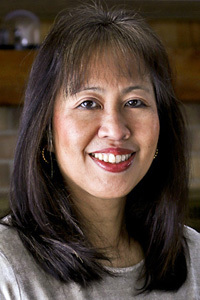 Congratulations on your kitchen aid!